Can I open any site I want to in SharePoint Designer 2010? You will see this when you attempt to edit a web file (html, asp, etc) in SharePoint Designer 2010 that does not have a site already setup. This is the error I received when creating a blank site, after being prompted to specify the location (URL) of the new Web site. No. I'm afraid not anymore. SharePoint Designer 2007 allowed you to build and maintain a non-SharePoint site. In the 2010 version of SharePoint Designer you no longer have that option. In fact, SharePoint Designer 2010 will only connect to a SharePoint Server 2010 server. You can find this information and more on the SharePoint Designer Team Blog site. When FrontPage was originally discontinued, Microsoft did this to spread out the products they offer (among other things). In doing this they created SharePoint Designer and Express Web. So, if you are developing with SharePoint you use SharePoint Designer. If you are doing just general disk based web-sites, you switch over to Expression Web. Microsoft is so nice to give you a pretty much basic path to take, as shown in the image below. Expression Web could be considered the true replacement of what FrontPage was originally designed to do. While SharePoint Designer is built toward a specific purpose (working with SharePoint sites). The one caveat to all this is that SharePoint Designer is free. 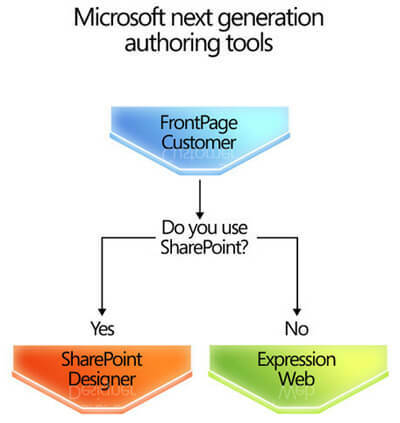 I can understand this due to the amount of money a organization will spend on implementing SharePoint. Microsoft Expression Web will cause you to reach for the wallet. Although not as expensive as some of the Microsoft Products out, it still costs money. I used Expression when it was first released for a few things and it was a good tool for web development. So what is next...If you want to play/design/develop with SharePoint Designer 2010 you will have to find a source that allows you to connect to a SharePoint 2010 Site. Due to the hardware/software requirements of SharePoint Server 2010 it will require a 64-bit environment (host) for both SharePoint and the backend datbase. VMWare Server is free and does support 64-bit guest, if you are running a 64-bit host. The caveat to the Window OS: it is not free. You can download a 180 day trial, although a better option maybe to invest in a MSDN subscription or TechNet Subscription that will give you access to download software for testing and development purposes.